When Project Coast was launched in 2018, Unipart Logistics committed to the elimination of single use plastics in our supply chain by 2020. The Virgin Reverse team in Nuneaton is making good progress towards this goal. As a result of their problem solving approach, the Virgin Reverse team in Nuneaton has designed new packaging that can eliminate 95.5% of all single use plastics from the Repair Packs. Here’s how they approached the problem. It was always believed that shrink wrap was the biggest source of single use plastic in our operations. 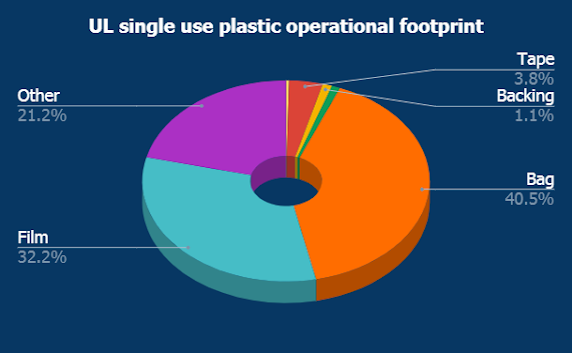 Further investigation has revealed that plastic bags used for packaging are in fact the biggest contributor across all of our sites, adding 40.5% to UL’s overall operational footprint. Another area for concern across Unipart Logistics was that of the high volumes of plastic cups and bottles used in our canteens and vending machines. Steps have already been taken to move away from the sale of fizzy drinks in plastic bottles. The Virgin Reverse Team in Nuneaton handles around 5,000 mobile ‘phones each month. Around 75% of these are returns and 25% are repaired and returned to the customer. A detailed analysis of the single use plastics being used in the Virgin supply chain revealed that they were using more than 1.5 tonnes every year. With the full support of Virgin, the team has worked together to develop a solution which would not only prove to be recyclable, reducing waste of any kind, but they have designed a box which could eliminate 95.5% of all single use plastics from the Repair Packs. Internal trials are now underway to gather feedback on the newly designed box. Meanwhile, Virgin is working on the branding of the new packaging. If all goes according to plan, the new recyclable boxes could be introduced in 3-4 months’ time, setting this team well on its way to achieving its goal of eliminating single use plastics completely by 2020.